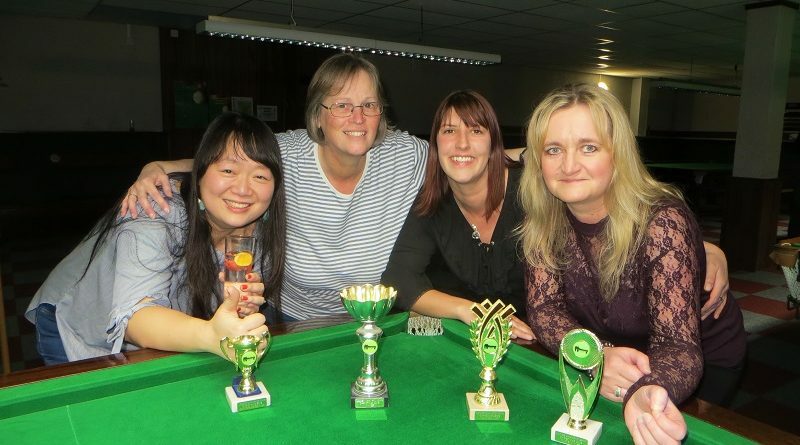 JACKIE Ellis has retained her Ladies Championship title at Chandlers Ford Snooker Club. The Cuestars Seniors Tour player beat Trudy Schwedler by two points in a 20-minute timed final. Ten women competed in the charity event in aid of Wave 105 Cash for Kids. Ellis, 52, travels down from Clyffe Pypard, a village near Wootton Bassett, to Chandler’s Ford every Saturday. Her son Riley, 14, competes in the junior leagues and they both play in the handicapped Open Series. The women’s world number 23 admitted that conceding an eight-point handicap start to all of her opponents, instead of receiving one, was a new and challenging experience. She said: “It was a new situation for me, having to give a handicap rather than being given one. Six of the women have sons and daughters competing in the club’s Saturday morning junior leagues. Julia Kline lost to Ellis and Lorraine Colliss was knocked out by Schwedler in the semi-finals. Michelle Jeffery, who actually beat Ellis in the round-robin group stages, overcame Zoé Thomson in a raucous Plate final. Two new high breaks were recorded. Schwedler compiled a 14 against Jeffery in the round-robin group stages and Kelly Read knocked in a personal best eight. The fun evening included a buffet, exotic cocktails and a karaoke session. Trophy winners, from left: Zoé Thomson, Jackie Ellis, Trudy Schwedler, Michelle Jeffery.